Cut a pocket in each chop by cutting from fat side almost to bone; set aside. In a 4- to 6-quart pressure cooker, crumble pork sausage. Cook and stir over medium heat until browned; drain in a colander. In a medium bowl, combine the pork sausage, stuffing mix, dried cranberries, applesauce, salt and pepper. Spoon one-fourth of the stuffing into each chop. Secure pockets with wooden picks. Heat oil in the pressure cooker over medium heat; brown chops, 1/2 at a time, for 2 minutes per side. Arrange all chops in the pressure cooker. In a small bowl, whisk together the salad dressing, pumpkin butter and chicken stock; pour over chops. Lock lid in place. Place pressure regulator on vent pipe. Over high heat, bring cooker up to pressure. Reduce heat just enough to maintain pressure and pressure regulator rocks gently; cook 9 minutes. Quick release the pressure. Carefully remove lid. Transfer chops to a serving platter. Bring liquid in cooker to boiling. Reduce heat and simmer, uncovered, for 3 to 5 minutes to desired consistency, stirring occasionally. Serve chops with pumpkin gravy; sprinkle with pumpkin seeds, if desired. 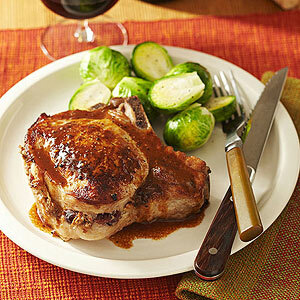 Oven Method: Prepare chops as above, except cook sausage in a large oven-going skillet and brown chops in skillet. Add salad dressing-pumpkin butter mixture. Cover and bake in a 350 degrees oven for 35 minutes. Remove lid. Bake 10 minutes more or until chops are cooked through (145 degrees F to 160 degrees F). Transfer chops to a serving platter; lightly tent with foil. Carefully return skillet to stove top. Boil gently, uncovered, for 3 to 5 minutes to desired consistency. Serve as above.